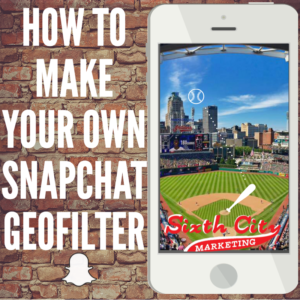 Everyone knows that Snapchat’s Geofilters have been all the rage for the last two plus years, and creating your own filter for either a community or a special event is easier than you may think. In the past year, Snapchat has expanded the possibilities for creating custom geofilters. You can now choose between creating a permeant community filter (based on a location) or an on-demand filter for an event (based on choosing dates and a location). If you decide you want to make a filter for an event, Snapchat has also recently introduced an online design tool for the on-demand filters, which is useful if you aren’t highly skilled with Photoshop and Illustrator, or are just looking for something quick to add to your pics. These on-demand filters allow you to choose from three types of events: celebrations, birthdays, and weddings. They have preset text, along with customizable text features. You can also upload custom graphics as well. The only downside is that you cannot delete some of the default template features, so they aren’t 100% customizable with this tool. Once you finish designing, you pick a place and time for your filter, pay, and will hear back from Snapchat within one business day. But if you want to create a custom community or on-demand filter, read on. 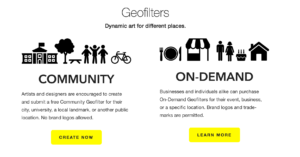 Snapchat provides a set of guidelines for both community location filters and on-demand filters. At the moment, businesses are not eligible for community geofilters, nor are logos or trademarks. The geofilter must be custom artwork and design, or it will not be approved. On top of that, Snapchat has additional rules and tips for submissions. 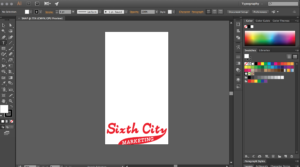 Step 3: Start Creating Your Geofilter! Assuming you have a design in mind, the next thing you need to do is create a file in Photoshop or Illustrator in the correct size of 1080×1920. Once you have created your design, make sure to save it for web, as a transparent PNG under 300KBs. Now it’s time to submit your work to Snapchat. 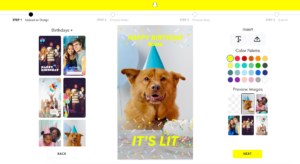 Snapchat supplies different submission pages for both community filters and on-demand filters, so be sure to select the correct one. The page will ask you to circle a location area on an interactive map and enter basic information about yourself. Pro tip: One of the ways to help ensure your filter is chosen is to write in the boxes explaining why this location is meaningful to you and others. This acts as the selling point for why Snapchat should choose your filter, and could make all the difference! Like previously mentioned, on-demand filters take just one business day to be approved. However, community geofilters may take longer. Once your filter has been approved, it can take up to 24-hrs for the filter to be ready to use for people in your selected area. If it is not approved, you will receive an email explaining Snapchat’s rationale. Take these reasons into consideration, make some edits, and try again! Need Help with Social Media Marketing and More? 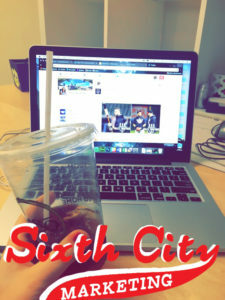 Sixth City Marketing is here to help you explore the benefits of Snapchat and other social platforms. Contact us today, because we offer a range of services such as social media marketing, web design, SEO, and PPC to help your business thrive. We look forward to working with you!